Bolchazy-Carducci: What Color is it? : Quo colore est? What Color is it? : Quo colore est? Color-learning with a new twist: in Latin. 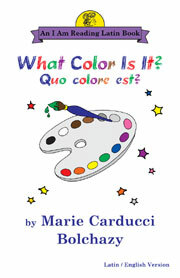 Aided by original artwork and an English translation, children learn the Latin words for a full range of colors: red, yellow, blue, pink, white, gray, black, purple, brown, green. In the process of learning the color words, they also learn words for apple, flower, pet, food, bird, and canary. Finally they get to select their favorite color. The original artwork is charming and creative. A complete vocabulary, with emphasis on derivatives, and pronunciation guide are provided; a recording of the text is also available. Experts recommend that children start a foreign language as early as possible. With this book, a child can start learning Latin at age four. Latin is an excellent foreign language to select. Just ask any lawyer, doctor, scientist, nurse, or linguist. Latin book for primary-age children: a rarity! What Will I Eat? : Quid Edam? Who Loves Me? : Quis me amat? Quo Colore Est? Using children's books translated into Latin to teach grammar. The result students will know the names of eleven colors and understand that nouns and adjectives of the same or different declensions modify one another in case, number, and gender.